Why do some communities thrive and others struggle? 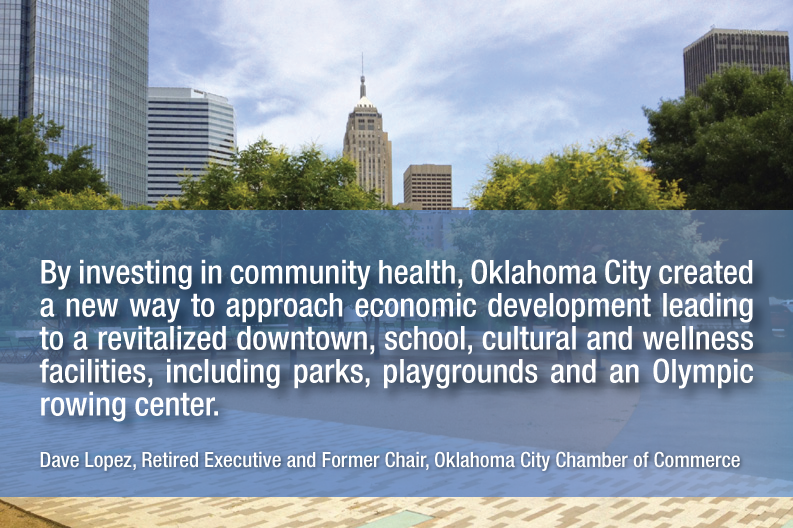 Health factors often make the difference in workforce and community business competitiveness. The good news is that building a Culture of Health in communities is possible and can have big payoffs for everyone, including the business community. Getting involved is easy, fun and good for business top and bottom line. For more in-depth resources, check out our Learning Modules. What does your ZIP code have to do with your health? According to experts, about 80% of our health is influenced by factors outside the doctor’s office and where we live, learn, work, and play. Health Means Business Champion GSK is deeply involved in investing in community well-being. Katie Loovis, director, corporate responsibility explains GSK's approach, "GSK’s mission is to help people do more, feel better, and live longer. To live our mission, we recognized we must go outside the doctor’s office and address health challenges where they start – and that’s in our communities. We’ve learned many things over the last few years, which has informed our community involvement strategy as we’ve gone from Denver to Durham. Throughout it all, the County Health Rankings and Roadmaps have anchored our approach. The roadmap helps us know which interventions have evidence to back up their effectiveness and tools like this one, which identifies life expectancy by zip code, helps us continually sharpen our focus." The Alliance for a Healthier South Carolina was recognized in 2015 by the Robert Wood Johnson Foundation as a national leader in creating a Culture of Health. Jim Reynolds, CEO of Total Comfort Solutions, gave credit for South Carolina's success to a cadre of state business leaders who took a leadership role on education, workforce development and now, wellness and health. "South Carolina was fortunate in that business leaders working through the state chamber of commerce took a leadership role over the last twenty years on improving education and workforce development. The continuity of the business community was what made the difference. We are now applying this model to health and wellness," said Mr. Reynolds. Sodexo recognizes that the quality of life in the workplace means crafting an environment of respect for people, for wellness and for greater productivity. This respect translates to a business that understands that the wellness of people has a direct connection to the organization's bottom line. In a new program being trial run in Florida, Sodexo is partnering with the YMCA to offer its employees, their families and Sodexo's front line workers YMCA memberships along with comprehensive wellness programming for better physical and emotional health. All of our Health Means Business Champion communities tell us that one of the hidden keys to business sector success is having access to an educated workforce. Business leaders and communities across the country are investing in education starting at Pre-K and going all the way through college and job training programing for children and young adults. Education and health outcomes are also connected. Our toolkit for Investing in Education, created by the U.S. Chamber Foundation’s Center for Education and Workforce, is a great starting place to find tips and tools for how to get involved in strengthening education policy and outcomes in your community. The Health Means Business Campaign will have traveled to 10 communities through forums held at local and regional chambers of commerce by the end of 2016. The purpose of each forum is to engage local businesses and other key community stakeholders in discussions about health, education, and economic outcomes, and to encourage increased business involvement in building healthy communities. The U.S. Chamber Foundation is making all of the materials from these forums available to any community that would like to host a community health event and is partnering with communities that would like assistance in hosting a Health Means Business Forum. Access the Learning Module to learn more. Need more ideas? Our Health Means Business Champions Handbook provides step by step guidelines based on best practices from our network on how businesses can invest in building a Culture of Health in their communities. Access the Learning Module to learn more.